Setting up a hotel conference room or ballroom for a successful live entertainment performance requires some pre-event planning and coordination with your event planner. It is time well spent, however, since common setup mistakes can very easily put your entertainer or speaker at a disadvantage before the show even begins. We have seen many top speakers and comedians struggle in corporate event settings where the stage setup did not allow them to deliver their best possible performance. Many artists will provide a setup rider with their preferred performance setup. If they do provide one, try to follow it is as closely as possible. A rider will outline exactly what you need to do to help create a performance environment that will help you get what you paid for…a great show! If you are not provided with a rider, there are still things you can do to help guarantee the success of your event entertainment. The following suggestions are easy to implement and can dramatically increase the enjoyment of the entertainment at your next conference, meeting, or dinner. 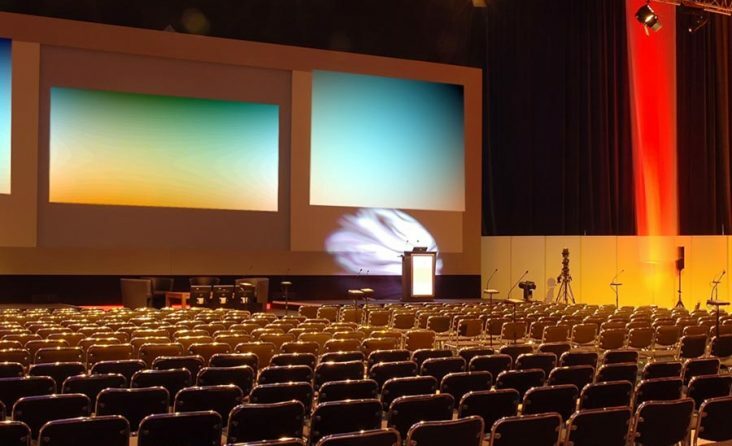 Probably the most common mistake corporate event planners make is putting the stage too far away from the audience. A dance floor, or any large empty space between the audience and the stage creates an instant invisible barrier between the presenter and the audience. It can be very hard for a presenter, no matter how engaging they may be, to close this “gap” and fully connect with an audience. This, of course, does not apply if your entertainment is solely a live band, and people will be dancing. Therefore, when you are setting up the room, try to arrange the stage area in a way that allows the audience to be as close as possible to the stage. We always suggest that clients start their first row of tables or chairs about 12 feet from the front of the stage. This puts the audience close, while still allowing a little room for servers to get to the tables if a meal is being served before the performance. If you have hired a speaker, comedian, or other entertainment, you want the stage close to the audience. If your event is very large, video screens with live camera feeds of the performance can help make a big room feel smaller and help give more of the audience the feel of being up close to the show. Sometimes, if it is absolutely unavoidable to have a dance floor in front of the stage, the venue will setup chairs in “theater style seating” on a dance floor for audience seating to fill the empty space, with the idea that people in the back of the room will come up and sit in front. This is a great idea, if people actually fill up the chairs. If you give people the “option” to move up to seats on a dance floor or stay at their tables, they will stay at their tables 99% of the time. Then you have an even bigger problem of the performer in front a sea of empty (or nearly empty) chairs. It addition to keeping the audience close the performance, you also want to keep the audience close together. People laugh out loud more and applaud more when they are in large groups and in close proximity to one another. Laughter, applause and excitement is contagious. The best way to encourage your audience to sit together is to try and only have enough seats for the number of people who will be attending. Many event planners will try to “fill” a big room by putting up way too many extra tables and chairs. In reality, all the empty chairs end up making the room, and your event, seem smaller. It also leaves your guests wondering why so many people did not show up. If you are not sure how many people will be showing up to your event, put “RESERVED” signs on the BACK half of the room to gently force people to sit together in the tables or seats up front. You can then remove signs and open up tables, if needed. A row of empty tables in the back will be less noticeable and distracting than a row of tables up front, or a room full of tables that are only half full. This “reserved sign” strategy for getting the audience to sit together is also great for conference retreats, sales seminars, and employee dinners, as it encourages more socializing and will noticeably increase the energy of the room, as well as make your event seem bigger. It may seem like an obvious statement to make, but the audience should be able to see what is happening on the stage. But, many times event planners don’t realize there is problem seeing the stage, until it is too late to do anything to correct it. Pillars or supports in a room can easily cause sight line issues. Make note of any potential obstructions as you consider event spaces and begin planning your room layout. The biggest culprits for making it difficult for audience members to see a show are centerpieces. Big, tall, showy centerpieces are nice, but also easily block the view of the stage for 50% or more of the audience. If you must have a centerpiece, keep them short. This not only will help your audience see the show, but it will make table conversation easier for your guests. A poorly lit stage can also make it hard for people to see that is going on. The stage area should be as bright as possible during the show. Stage lighting, if available, is always the best way to light a stage. Many venues can arrange for stage lighting or spotlights for presentations. If stage lighting is not available, be prepared to turn-up the room lighting in the area over the stage during the entertainment portion of your evening.. If you have questions about whether certain parts of the audience will not be able to see the stage, take a moment to sit at the table or in the seats in question and see for yourself if there is an issue. Try to do this early in the room setup, when you have time to move tables, adjust centerpieces, or rearrange decorations. Most event managers at conference centers and banquet facilities will be more than happy to work with you to plan a room setup that works for the entertainment, meal, and any other activities that might be happening at your event. The above tips are not just for hiring professional entertainment. The setup suggestions can be easily implemented for your next company awards dinner, sales meeting, or your CEO’s big speech at your holiday party. You are almost certain to find that your audience will be more engaged and excited about the presentations.